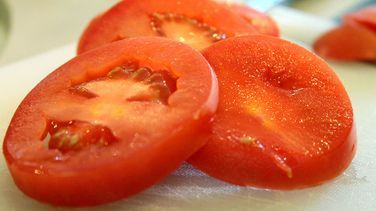 Do you think that you or your child have a Tomato Allergy? The good news is that you probably don't. Every week I see patients who think that they have Tomato allergy. Thank fully most of them turn out to have the less dangerous Tomato Pseudo-allergy (somethings that looks like an allergy - but isn't). Tomatoes are part of the Nightshade or Solanaceae family of plants. this family also includes potato, tobacco, aubergine, peppers and chillies. There is a lot of allergic cross-reaction across this plant family. Don't eat the green bit of tomatoes as it is supposed to be poisonous. I haven't tried it myself but, as tomato is in the Deadly Nightshade family I'll probably give it a miss just in case. A tomato has a variety of allergens spread across its skin, flesh and seed and pollen. It can get quite confusing. Tomato skin/flesh profilins will cause only a mild reaction and you may cross-react with peppers and grass pollen. Tomato pollen profilins cross-react with birch pollen, melon, watermelon, banana, citrus fruits again causing mainly mild reactions. Tomato, potato and latex all contain a protein called Patatin which can also cause allergic reactions. Most of my patients who think that they have a tomato allergy actually have a pseudo allergy. The commonest scenario is a small child who get red facial flushing after eating (or messily attempting to eat) tomato ketchup or a similar sauce. It is the direct contact on the skin from the chemicals and acidity in the sauce that causes the reaction in the child's sensitive skin. Some say that it is caused by naturally occurring histamines or salicylates in the tomato which act directly on mast cells to cause the reaction whereas others say it is caused by aromatic volatile ingredients. Some babies and toddlers get one-sided face redness when they eat sour or spicy foods. this can be caused by Auriculotemporal syndrome (or gustatory flushing syndrome), which often occurs in children born by forceps delivery. The forceps upsets the facial nerve which controls both taste, salivation and face flushing and some of the nerve fibers get crossed. this settles down with time. Remember sauces can have milk in them and mayonnaise will have egg..